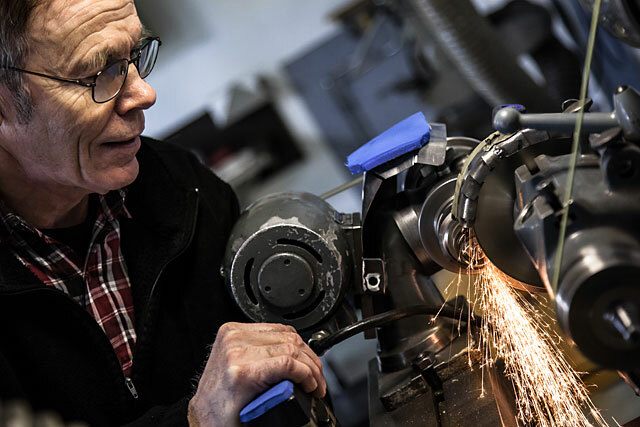 Pressmaster AB is deeply rooted in the heartland of Sweden – a country with a strong tradition of manufacturing some of the world’s best hand tools. The people of the region of Älvdalen have a long history of adapting to their environment by creating clever solutions. The processing of Porphyry, a very hard rock, from which the Älvdalen people made everything from jewelry to sarcophagus, is one example of the people’s ingenuity. Musicians like Elvis Presley and Frank Zappa have played guitars from Älvdalen and the electric guitar made the name of Hagström known all over the world. At times 90% of the production was exported. Attractive and well built, reasonably priced instruments were the recipe for success. Enhanced with a lot of technical innovations. Pressmaster is proud to be a part of this tradition of skilled craftsmanship and ingenuity. 1970 The foundations of what was to become Pressmaster Tool started on a small scale in Stockholm. 1973 The C-frame, the world’s first modern ratchet crimp tool, is invented and patented. 1975 Self-adjusting stripping tool is invented. 1976 Pressmaster Tool starts its manufacturing in Älvdalen. This is when business really takes off. 1976 The two-step and three-step Corex coaxial cable stripper is invented. 1979 The Desolder tool was patented. 1981 Pressmaster’s operations are concentrated in Älvdalen. 1981 A self-adjusting ferrule crimp tool is invented by Pressmaster. 1982 A Sales office is launched in USA. 1983 Pressmaster Tool gets a branch in England. 1984 Also Germany and France are now on the Sales office map of Pressmaster. 1986 A Pressmaster representative is hired in Japan. 1992 Pressmaster Tool is ISO 9001 accredited and has been ever since. 1993 A new and revolutionary ergonomic design is patented by Pressmaster when the K-frame is presented to the market. 1995 Pressmaster Tool gets an agent in Italy. 2000 Pressmaster Tool hires a sales person in Italy. 2001 Pressmaster Tool changes name to Pressmaster AB. 2001 The strip & cut tools Embla, Tor and Oden are patented. 2012 Phoenix Contact is the new owner of Pressmaster AB. 2014 The cut and strip tool Embla RA is launched. 2014 Rigidus 1.5 CH is launched. 2015 A Sales office is launched in Japan.